What to do with those aging bananas? I always buy a bunch of bananas and for some reason the last two have a better chance of making it into a banana bread than they do being eaten. Why are the last bananas always unwanted? Could be a not-so-subtle ploy by my family to have me bake a banana bread? Being the quintessential foodie mom, I pull out the stand mixer and start baking. I’ve been making this same recipe adapted from the Joy of Cooking for years. I recently tried to make a different recipe using honey and whole wheat flour, it was a disaster. So much for trying to be healthier. 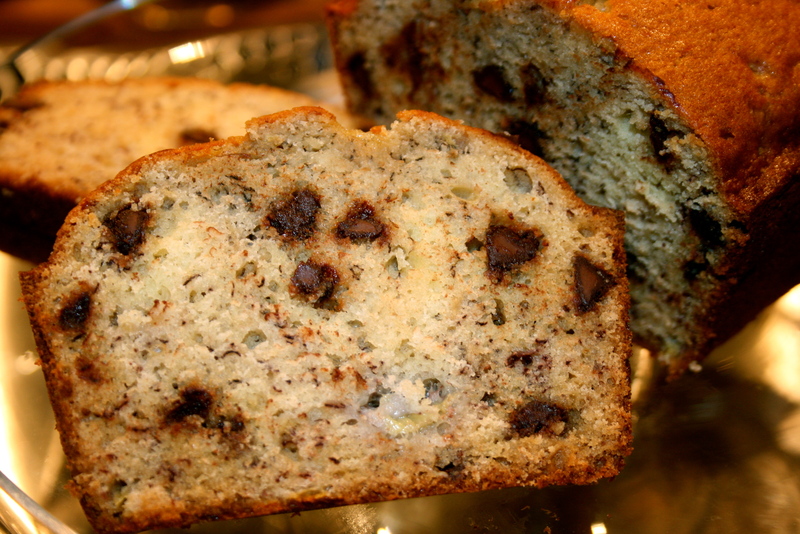 Let them eat cake… or banana bread! This is a no fail banana bread. Moist and sweet, it comes out perfect every time. Take the eggs and butter out of the refrigerator a couple of hours before you make this. They work better when at room temperature. Preheat the oven to 350 degrees. Butter (or grease) an 8″ loaf pan. Combine the flour, salt, baking soda and baking powder in a bowl. Set aside. Using a stand mixer or hand mixer, beat the room temperature butter with the sugar until smooth. Add the dry ingredients in thirds, mixing in between. Crack the eggs in a small separate bowl and lightly beat. Add eggs to the mixer slowly and combine. In separate bowl (I just use the empty dry ingredient bowl so I don’t make more dishes) mash your bananas (leaving a few little chunks). Take the bowl off the mixer and stir in the bananas by hand, then stir in the chocolate chips. Don’t over mix. Pour the batter into the prepared pan, smooth the top with your rubber spatula and bake for about 50-60 minutes or until it’s golden brown and a toothpick comes out clean when inserted. Let cool in the pan for 10 minutes, then turn out on a cooling rack and allow to cool completely. * A couple of notes… you can also add raisins which I love and my family hates. Or you can add nuts (chopped walnuts are nice). I’ve made this with all three (chocolate chips, raisins and nuts), and then you can call it Banana Junk Bread. Yum! Depending on how large your bananas are, when the bread bakes it will crack along the top and may seem under done along the center crack. If your toothpick comes clean everywhere else but in that center part – it’s done.